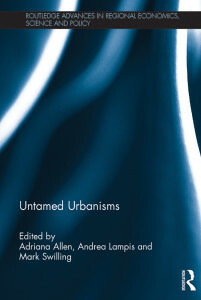 Untamed Urbanisms, published by Routledge in 2015, is an edited volume resulting from the International Social Science Council (ISSC) World Social Science Fellows’ seminar Sustainable Urbanisation I, which took place from 25-30 March 2013 in Quito, Ecuador. The seminar brought together 19 Fellows to work on creative, interdisciplinary perspectives on sustainable urbanization. After six intensive days, they identified four broad thematic areas that can form the basis for new perspectives on urbanization, what makes it (un)sustainable and how the challenges it raises can be addressed differently. The book resulting from the seminar, Untamed Urbanisms, aims to re-politicise the relationship between urban development, sustainability and justice, and to explore the tensions emerging under real circumstances, as well as their potential for transformative change. The volume is edited by the convenors of the seminar, Mark Swilling (Sustainability Institute, Stellenbosch, South Africa), Adriana Allen (University College London, UK) and Andrea Lampis (Universidad Nacional de Colombia). One of the major challenges of urban development has been reconciling the way cities develop with the mounting evidence of resource depletion and the negative environmental impacts of predominantly urban-based modes of production and consumption. By drawing on a range of case studies from both the global South and global North, this book is unique in its aim to develop an integrated social-ecological perspective on the challenge of sustainable urban development. Through the interdisciplinary and original research of a new generation of urban researchers across the global South and North, it addresses old debates in new ways and raises new questions about sustainable urban development. An electronic version of this book is available Open Access.